This unique U-arm features a compact design with dual telescoping arm movement that permits installation in settings having ceiling heights of just eight (8) feet. Its fully motorized movements for SID, arm rotation, height, and detector angle can be automatically programmed to user-specific radiographic positions utilizing the intuitive touch-screen located tube side, a hand held remote control, or by using the technologist workstation. 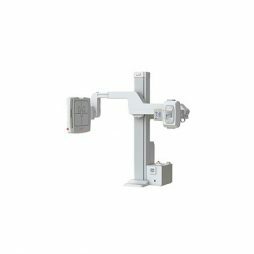 Complemented by a durable bucky design with an easily removable grid, automatic collimation, patient safety anti-collision sensors, and an available mobile table, the RU-3000 is full featured and well-suited for all imaging environments, especially orthopedics, imaging centers, and urgent care.